I just can't believe how amazing these lanterns are. And the great news is that they can be done incredibly inexpensively, with primarily dollar store items! The most expensive part is the lantern assembly, but you could probably upcycle some cheap lantern from the thrift store. You could also make these with glow sticks, for some temporary lighting. I just absolutely love these, and am going to have to make a least one of these bad boys this summer, though I think I'll end up making a few in different sizes to group together, like a big bloom (swarm) of them. So pretty! 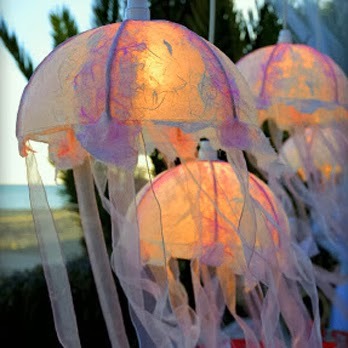 Head on over to Germani Decor for a great tutorial on how to make you own amazing jelly lantern. Thank you. I haven’t updated in ages, so I can’t attest to how easy it is currently to use BlogSpot as a blogging platform. However, I did enjoy using it when I did blog regularly, as it is very user friendly. I have some HTML knowledge, but it is very rudimentary, and I liked that I didn’t need to rely on having to do my own coding. Thank you so much. I haven’t updated in ages, but have recently been thinking about reviving this ol’ thing. I honestly don’t center myself or anything like that before writing. I don’t actually like my own writing most of the time, so I’m not really a great resource for writing tips.